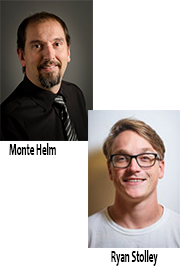 Congratulations to Dr. Monte Helm and Dr. Ryan Stolley, Pacific Northwest National Laboratory, on having their commentary appear in the November 2014 issue of Nature Chemistry. The journal's editors asked the scientists from the Center for Molecular Electrocatalysis to write a "news and views" article on a recent report about the catalytic production of hydrogen (H2) from renewable sources. They wrote a short, accessible piece highlighting the report's results on combining light-harvesting material and a non-precious metal catalyst to harness solar energy to produce hydrogen fuel. Dr. Michael Wasielewsi and Dr. Samuel Stupp, Argonne-Northwestern Solar Energy Research Center, led the creation of the first photoactive hydrogel medium to efficiently shuttle electrons and perform catalysis, mimicking photosynthesis. Helm and Stolley note the hydrogel is an exciting step toward efficient energy storage systems. Their article is "Light-harvesting materials: Soft support for energy conversion." The Center for Molecular Electrocatalysis and Argonne-Northwestern Solar Energy Research Center are Energy Frontier Research Centers. These and the other EFRCs are funded by the U.S. Department of Energy, Office of Science, Office of Basic Energy Sciences.